If you’re looking for an interesting, moisture-loving plant to add to the garden, consider planting flag iris. Both growing conditions and flag iris care are a relatively easy undertaking which will reward you with beautiful blooms each year. What is a Flag Iris? Flag irises are very hardy perennial plants that survive with minimal care and generally bloom in the spring and early summer. Flag irises are most often found in wet, low-lying areas and are suitable for similar conditions in the home garden. There are many varieties of flag irises, including dwarf and tall types. The most common types of flag iris plants familiar to most people include blue flag iris and yellow flag iris. Blue Flag Iris – Blue flag iris (Iris versicolor) is a beautiful semi-aquatic plant. Deep green foliage and striking blue-violet flowers appear on 2- to 3-foot stalks in late spring to early summer. Leaves are narrow and sword-shaped. 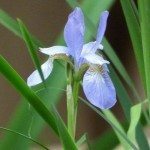 There are many species of blue flag iris and native plants are found along the edges of swamps, wet meadows, stream banks or in forested wetlands. This hardy plant adapts well to the home garden and is very easy to grow. Yellow Flag Iris – Yellow flag iris (Iris pseudacorus) is a perennial plant that is native to Europe, North Africa, Great Britain and the Mediterranean area. Yellow flag iris is prevalent all over North America, apart from the Rocky Mountains. Generally found along wetlands, streams, rivers or lakes in shallow mud or water, this hardy plant will also tolerate drier soil and high soil acidity. Gardeners who often use this iris as an ornamental pond plant value the yellow flowers that bloom in the summer. 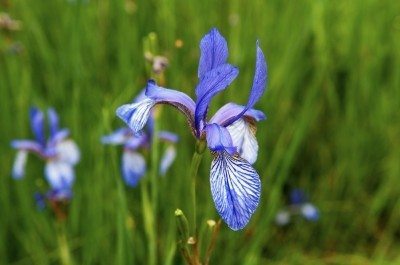 However, it can quickly become invasive, and gardeners must beware of this in order to provide the most appropriate flag iris care. The best place to plant blue flag or yellow flag iris is in a wet location that gets full to part sun. The plant can also be submerged in water for a time and still survive. Space plants 18 to 24 inches apart. Flag irises do best in highly organic soil. Amend your garden area with compost or peat for best results. 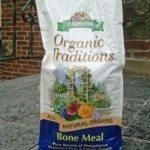 Provide a dusting of bone meal when you are planting flag iris. Be sure to water your plants liberally if the soil begins to dry out. Although flag irises are hardy and will tolerate spells of dry weather, they prefer to be moist. Provide a 2-inch layer of mulch to protect plants and help retain moisture. Propagate plants by division right after flowering every two to three years to keep under control.